On a summer vacation, Monastir is founded by childhood friends and guitarists Marcus Olsson and Magnus Björk. Back in Sweden bassist Joel Edin, keyboardist Fanny Wedmark and drummer Björn Olszewski got drafted and the grain of sand from the Sahara Desert became a solid rock. Record company A West Side Fabrication took the band under its wings and soon debut single Rendezvous was released. Strangely, it was B-side Disconnect My Speaker that propelled into the radio airplay charts in summer 2002. The A-side became a hit on college radio stations. The papers dubbed Monastir "the future of Swedish indie-rock." 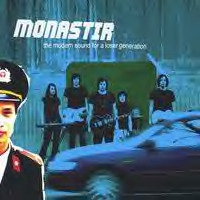 Second single Teenage Years with its accompanying, humorous, chaotic video preceded the self-produced first full length album The Modern Sound for a Loser Generation. Lead singer Magnus Björk is also a stunning studio wizard. With the wall-of-sound the Jesus and Mary Chain-way, the 1-2-3-4 attitude of The Ramones and melodies of pure pop genius the band went on the road and toured Scandinavia. From small underground clubs to bigger festival venues Monastir became the tight unit they are today.